On behalf of the Akunyili's family, I wish to officially confirm the death of Prof. (Mrs.) Dora Nkem Akunyili, OFR, in a Specialist Cancer Hospital in India this morning at 10 am, Nigerian Time, after a two-year battle with cancer. 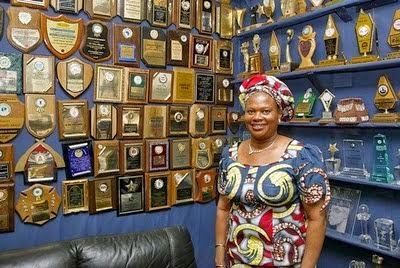 In spite her illness, Prof. Akunyili was unwavering in her belief in a better Nigeria. That was why she defied her condition and was part of Anambra State Handover Committee and the National Conference. The last time I visited her in India, even when she needed all the prayers herself, she was full of concern for the abducted Chibok girls, security and other challenges facing the country and told me that she remained prayerful for the release of those girls and for God to help President Goodluck Jonathan to overcome all the challenges facing the Nation. She therefore urged all Nigerians to remain prayerful and committed to building a better society for our children. We all prayed together and I promised to be visiting her every month. We thank all those who remain fervent in prayers for her recovery and urge them to remain prayerful for the peaceful repose of her soul.